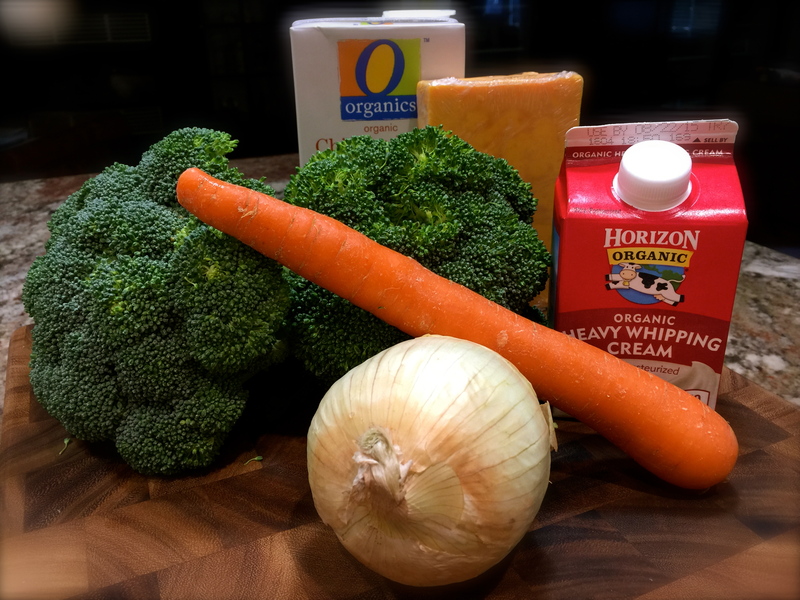 Broccoli Cheddar Soup… – You Betcha Can Make This! Even though we are in the midst of summer I still get cravings for soup. Now I have to admit I normally only make a home made chicken and dumpling soup (my mom’s recipe that I’ll post in the Fall) but this time I decided to venture into trying something different. 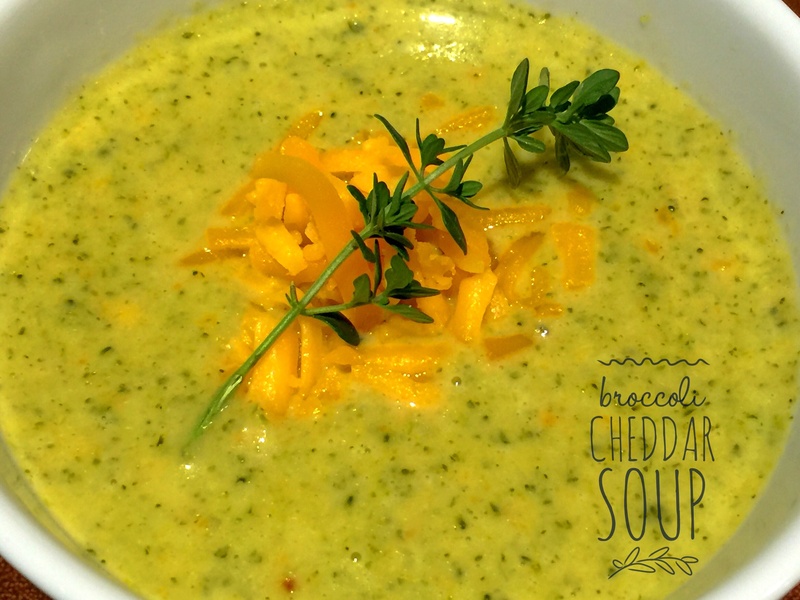 I researched various versions of broccoli soups and decided I wanted to do a broccoli and cheddar combination. 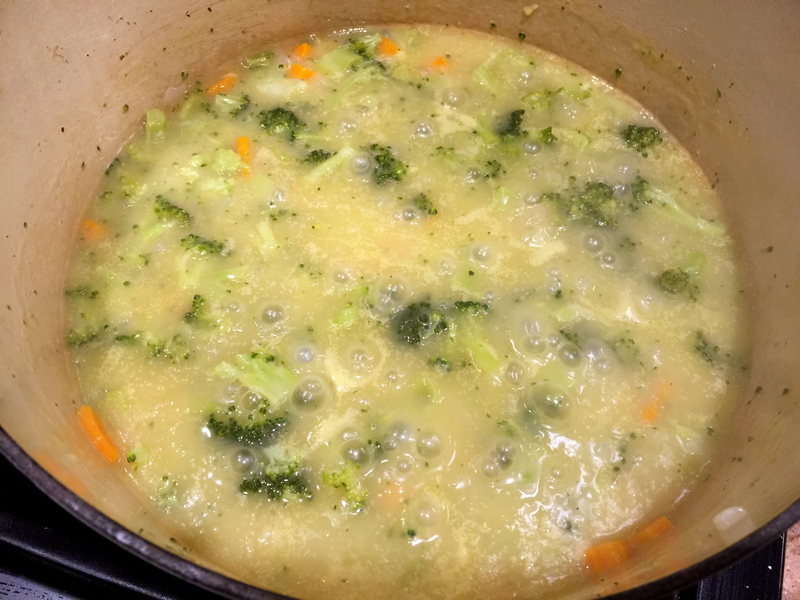 Lesson Learned 1 – Use all of the broccoli but cut the pieces small: Most often people tend to discard the broccoli stalks and they actually provide great flavor especially when making the soup. So when you are cutting up the broccoli cut up the stalks as well. Be careful to cut the stalk into small pieces. They are obviously more dense than the florets and will take longer to cook if you leave them in large pieces. The smaller you cut them the less time you will have to cook them. The same goes for the carrot. I took a pretty big thick carrot, halved it and then quartered it before slicing it. Carrots are also pretty dense and the smaller you cut them the faster they’ll cook. The nice thing about this recipe is you can chop everything up and put it in one big potl. You sauté everything at the same time and that makes it easy. Lesson Learned 2 – You may have to use both flour and cornstarch to thicken the soup: I know it sounds strange – but it worked. Once the vegetables sautéed in butter for about 5 minutes I added the flour and cooked it down with the vegetables for about a minute. You need to do this for two reasons: 1 – so you remove the “floury” taste from the flour, and 2 – So you won’t have any lumps when you add the liquid. After I cooked the flour with the vegetables I added the chicken broth (this was before I added the stock). As I was simmering everything the liquid seemed a little too light and runny as you can see from the picture on the right. So I added the stock and then systematically added some cornstarch mixed with stock to the soup to thicken it. I wound up using 3 tablespoons of each but added them in three separated batches. That way I could control how thick the soup was getting. You may find you are happy with the consistency you get by just using the flour. But if not, you can always added the cornstarch in small doses until you get your desire consistency. I would make sure to add some stock. I found that by adding one cup it gave the soup a richer color and enhanced the flavor. 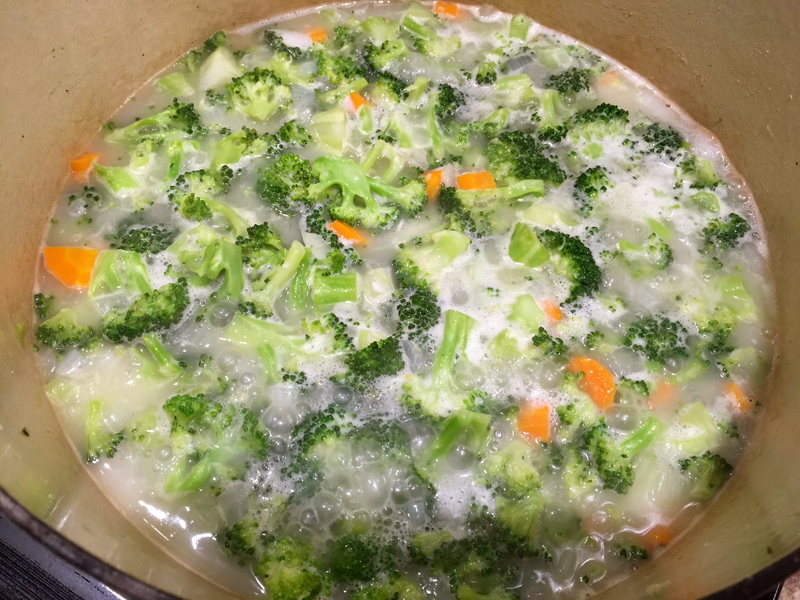 A couple of tips: Give the first cornstarch and stock mixture a little time to thicken the soup before you add more. The heat of the soup activates the cornstarch, but it takes a couple of minutes. Be patient. If after a couple of minutes you are not happy with the thickness add a little more. And, just remember, do not add cornstarch to the pot all by itself. You have to mix it with liquid and then add it in liquid form. Otherwise you’ll get lumps. I found a 1:1 ratio of cornstarch to liquid works best. Just make sure the cornstarch is completely mixed into the liquid before you add it (I stick my finger in and swish it around to make sure there’s not a pile of cornstarch on the bottom of the measuring cup). I could have mixed the cornstarch with water but since I had the stock, why not continue to add more flavor. Lesson Learned 3 – Use an immersion blender to puree the soup: Unfortunately I do not have an immersion blender (but I think it will be on my shopping list), so I used my blender to puree the soup. You can also use a food processor as well. I had to puree the soup in several batches using the blender. An immersion blender allows you to puree in the pot you’re cooking in and that’s much more convenient. But if you don’t have one, a blender or food processor will do the trick. They just require a little more effort. So here’s the recipe. I hope you enjoy it! Melt the butter in a large pot over medium high heat. 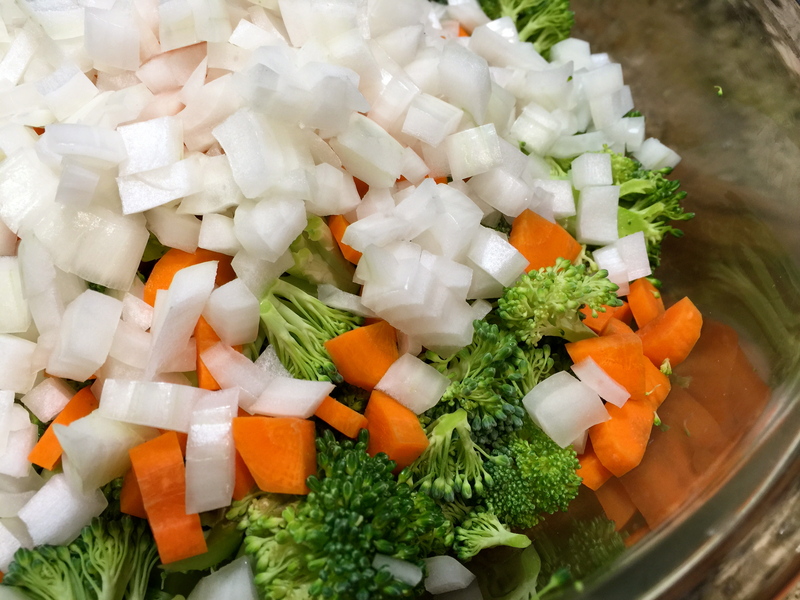 Add the broccoli, onion, and carrot. Add some salt and pepper. While vegetables are cooking mince the garlic over the pot using a zester and combine with the vegetables. Cook until the onions start to look translucent, approximately 5-7 minutes. Add the flour to the vegetables and stir for about a minute or until the flour begins to look blonde in color. Add the broth and stock and bring to a boil. Reduce the heat and simmer uncovered until the vegetables are tender, about 20-25 minutes. Check the consistency of the soup during this time. If it appears too runny pour in 1 Tbs. of cornstarch thoroughly mixed with 1 Tbs. of stock. Add more if needed. It should take no more than 3 Tbs. of each to reach a nice thick consistency. Simmer until all the vegetables are tender. Using an immersion blender, puree the soup. Add the cream and cheddar cheese. Stir until the cheese has completely melted.